This is the reason why I love stir-fry. It’s easy, quick, and decent and still tastes wonderful. The fat in the Shrimp will make you need a little less frying oil, I forgot about this and it seems quite oily in the picture. If you like the sauce, then you will be very happy with the sauce of this one. 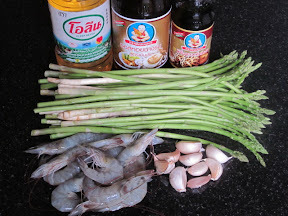 Fry the chopped garlic in vegetable oil in medium heat, when frying and you can smell the aroma, add the shrimp. 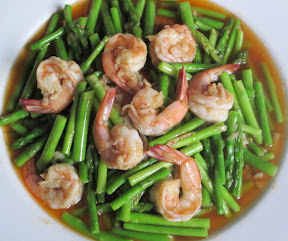 When the shrimp turn orange and about to be done, add the asparagus and season with oyster sauce and soya sauce. Give the good stir so the mixture mixes well and done! Serve with Hot steam Rice!